3. Mix 4 Tbsp sugar with 2 egg yolks and 3/4 cup milk. Put on low heat until thicken. 4. Cool mixture on ice. 5. 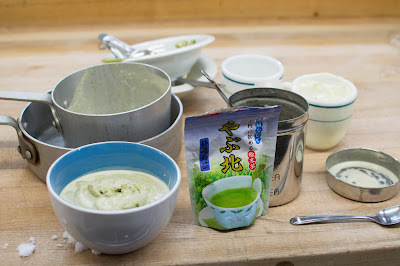 Add green tea mix in cooling mix. 6. Add 3/4 cup whipped cream to mix. 7. Start cooling a non metal bowl. 8. Pour mix into metal vessel. 9. Put on Extreme Cold Weather Gear. 10. Go outside and shake vessel for 15 minutes. The mixture will stop flowing after 15 minutes and will have the consistency of soft serve. 11. Scoop ice cream into cooled non metal bowl. 12. Cool Ice cream outside for 30 minutes..
13. Clean up and ready to serve!